http://maientertainmentlaw.com/?search=apo-furosemide-40-mg-for-lasix Adapted from diary originally published on May 5, 2012, the 150th anniversary of defeat the French forces by the Mexican Army at the Battle of Puebla. It’s May and it’s getting warmer here in the northeast. Tomorrow is Cinquo de Mayo, the only battle that the Mexican army won in their war with the French. It’s celebrated in the United States by many Mexican Americans as a source of pride. In Mexico, it is an official holiday in the State of Puebla where is is called called El Día de la Batalla de Puebla (English: The Day of the Battle of Puebla). Naturally, food and drinks are part of the festivities. There are various filling for Quesadillas but essentially they are the Mexican version of the French crepe using a flour tortilla instead of a thin pancake. It can contain vegetables meat or sea food, especially shrimp, or not, but it always has cheese. Use your imagination, be creative. Shredded or thinly sliced grilled chicken, beef, pork or shrimp. You’ll need a grill pan or a 10″ large, heavy flat skillet, cooking spray or a small bowl of vegetable oil and a brush, a large spatula and a cookie sheet lined with aluminum foil and a dinner plate. Preheat the oven to 200° F. Heat the skillet over medium heat, sprayed with vegetable oil. Place a tortilla on a dinner plate. Over half of the tortilla about a inch from the edge, spread some salsa, sprinkle with cheese, refried beans and shredded chicken/beef/pork/shrimp. If you like extra “heat”, add some jalapeño pepper slices. Fold in half. You can also cover one tortilla with fillings and top it with a second but it’s harder to flip. Gently slide onto the skillet. Let brown for 2 to 3 minutes until golden brown. Using the large spatula, flip, cooking 2 to 3 minutes, until golden brown. Adjust the heat if browning too fast or too slow. Place the finished quesadilla on the lined cookie sheet in the oven to keep warm. Repeat; making sure the pan is lightly oiled. You can do to or three at a time, depending on the size of the tortilla and the skillet. If you have a grill top on your stove, you can do as many as will fit. 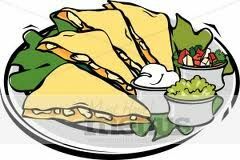 Cut quesadillas in half, thirds or quarters; serve with more salsa, refried beans, sliced jalapeños, sour cream, guacamole and avocado slices. This is the recipe I have used for years without complaints. I use 1800 Reposado Tequila, Rose’s Lime, Triple Sec, Kosher or course ground sea salt and fresh slices of lime. You’ll need either a shaker or a large glass filled with ice and a strainer and you’ll need lots of ice. Moisten them rim of a large glass with lime juice. Dip the glass into salt spread on a flat plate. Fill glass with ice. In the shaker or other large glass filled with ice add tequila, Triple Sec and lime juice. If user a shaker, shake vigorously or mix with a stirrer in the glass. Pour through a strainer into the salt rimmed glass. Serve with extra lime slices.